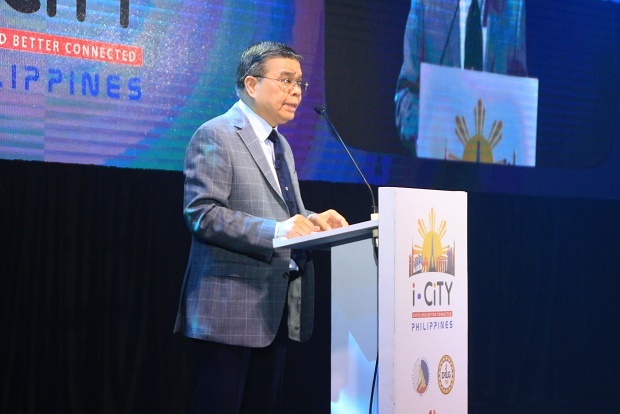 The local unit of Chinese tech firm Huawei recently threw its support behind the i-CiTY (intelligent city) Summit spearheaded by the Department of Information and Communications Technology (DICT) and the Department of Interior and Local Government (DILG). By sponsoring the conference at the Edsa Shangri-la Hotel in Mandaluyong City, Huawei Philippines is hoping that the Duterte administration would be receptive to the i-CiTY agenda it is pushing. "We believe the time is right for the Philippines to embark on this digital journey to transform the way we live, work and play in a safe and healthy environment. This will enable the citizens' to be content in this new sustainable society," said Jacky Gao, Huawei Philippines CEO. "In establishing i-CiTY ecosystem, we are committed to this country by sharing global successful use cases, project experiences through partnership with government, academia and business operators," he added. The i-City program, according to Huawei, aims for more inter-agency collaborations, readily accessible information, faster response rate, and consequently, an increased digital economy, better employment opportunities, improved living conditions and a more globally competitive Philippines. The i-CiTY brings together four key elements of a city's infrastructure and the services, which Huawei offers: digital city management, digital public services, digital industry, and safe city. These four key elements are underpinned by cloud infrastructure, communication networks and sensors which are the eyes and ears of an i-CiTY, according to the tech firm. The highlights of the summit's opening day included talks and panel discussions on global trends, public safety, e-government, and presentation of the i-CiTY financial and operational models. Knowledge-sharing on the safe city implementation of Bonifacio Global City in the Philippines and Bandung, Indonesia were also tackled during the event. The key output of the summit was the official launch of Philippines' Safe City White Paper — a commitment by the government and its partners from the public and private sectors to push for a safer and better connected country. The second day of the summit focused on the presentations of the DICT in connection to the National Broadband Plan and explained how technological innovations can help improve transportation system and public services to drive direct investments.